The Month in Theydon (July/August/Sept. ): Trevor Roberts latest report is on line Click Here. Parish Council Minutes: The minutes for the meeting of the 26th July 2007 are now available. Click Here. June 2007 Village News: The latest quarterly PDF version of Issue 58 of Village News is now available on line. Click Here. Essex. We won the Whitmore Trophy, a certificate and cheque for £150. We were previously winners in 2004. Calling all those interested in playing football that are over 35 years of age. 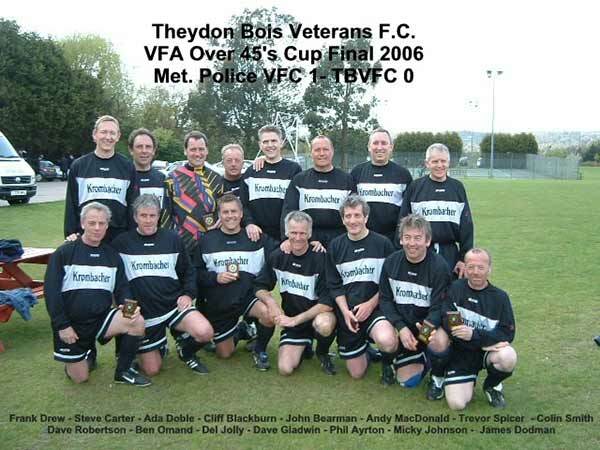 Theydon Bois Veterans Football Club needs you. Formed in Theydon Bois in 2000, we play on the Buxton Trust ground off of Loughton Lane on Saturday afternoons. The season runs from September until April. We play in two cup competitions, over 35 years and over 45 years and arranged friendlies. Food is provided after the game, which is washed down with something from the bar. If you are interested in playing contact James Dodman by email on j.dodman1@btinternet.com The first fixture is on 1st September away to Debden sports, so if you fancy a match please get in touch. the similar section open to all comers increase by a third. where nearly 80 photos were to be seen in 8 classes. cut in half by the judge, looked very appetising. colourful, interesting items much appreciated by the many visitors. produce the best show seen in the village for some years. The next Parish Council elections are due to take place in May 2008 when the existing council will have served its term of office. A number of the existing councillors have indicated that they will not offer themselves for re-election and the purpose of this article is to encourage villagers to come forward and stand for election. The Parish Council consists of eleven councillors who are appointed for a term of four years. Councillors meet on a monthly basis to discuss matters of local interest. Bi-monthly there is a public meeting where decisions are taken. There are sub committees for planning, environment and cemetery which also meet on a regular basis. In addition councillors represent the village at other meetings dealing with local matters including the Village Association, the Buxton Trust and Village News. It is not necessary to attend all meetings. 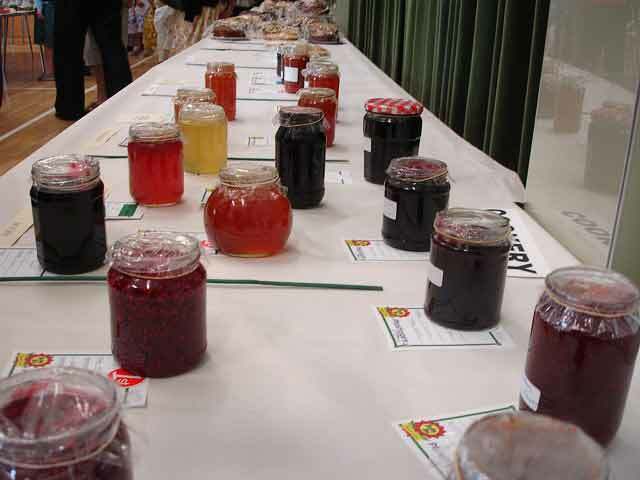 In addition to meetings there are tasks which need to be performed including litter picking, running the allotments and cemetery and assisting the clerk with the accounts. An Emergency Response Plan is maintained and it is likely that certain councillors would help the emergency services should a disaster befall the village. Ensuring that the village receives its fair share of district or county services is also an important task performed by parish councillors. Every planning application made in the parish is reviewed and passed on to the District Council planners with a recommendation. The current councillors all stood under the ”Conservative Alliance” label; they are a mixture of actual Conservatives and some like minded individuals, all of whom are happy to work together on a voluntary basis for the good of the village. This has resulted in the council being run on a totally non political basis. At the election the local Conservative party will provide assistance with the election formalities, publicity etc. No doubt the other political parties would be pleased to provide similar assistance to suitable candidates who wished to stand. In addition it is not too onerous to stand completely independently. There were no election in 2004 because there were just eleven candidates for eleven positions. In 2008 it would be highly desirable to have an election as, by having an electoral mandate the council will be able to move forward with confidence knowing that people have made a choice of who they want to represent them. Rubbish Collection: On the 11th July Epping Forest District Council announced some changes to the re-cycling of plastics. In addition to plastic bottles(such as milk bottles, drinks bottles, detergent bottles, shampoo and conditioner bottles) residents can now recycle margarine tubs, ice cream tubs, yoghurt pots, plastic food/vegetable trays and plastic bags by using the clear plastic sacks provided by the council free of charge. Bottle lids are now recyclable but it is best to squash bottles down to aid compaction. The Village Post Office performs many of the services provided by main branches including on the spot Euros and Travel Insurance, Car Tax and Fishing Licences. So next time you pop over to France for a days shopping remember where to get your cash. Lightning Strikes Theydon: At around 12 noon today (Friday 20 July 2007) this tree in Poplar Row, Theydon Bois was struck by lightning sending one of its uppermost branches crashing to the ground. 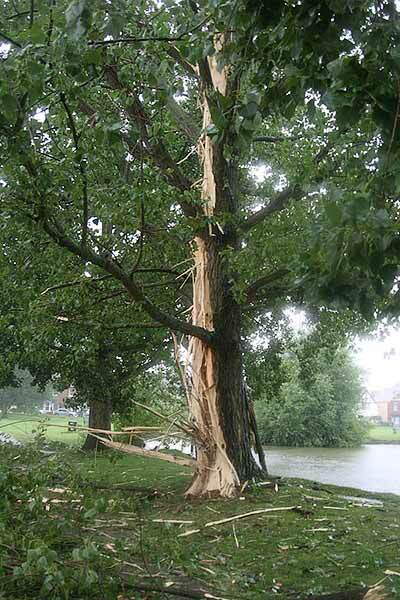 The lightning, in traveling to earth, blew the bark off the entire length of the trunk and sent shards of wood flying for yards around. A resident from a nearby house said “It sounded like a bomb going off; we thought it had hit the house. The splinters have landed up to 75 feet away.” Fortunately, we do not believe that anyone was hurt in the natural incident. We moved as much debris as we could lift out of the road, but the main fallen branch was extremely large and heavy. We had already notified Epping Forest Conservators who attended within the hour to deal with the fallen branch. They were going to reduce the fallen timber and return in a day or two to deal with the tree itself. Another of their team reported that the flying debris from the strike had broken 10 window panes in Pakes Farm. Their first conclusion was that the tree would probably have to be felled. The felled tree would then be taken into the forest to be allowed to decay naturally. Epping Forest Multi Faith Forum is seeking more members to join its newly formed group. The Forum, an initiative of the Epping Forest Local Strategic Partnership, had its first meeting in May this year, has been established in order to bring communities together and to encourage understanding, goodwill and friendship between different faiths and cultures. The LSP tackles key issues for local people – such as crime, jobs, learning, health and housing – and requires a range of local organisations working together. Formed in October 2002 the partnership’s core membership represents the public sector, community and voluntary sector, faith community and local business, working together as a single body. Marina Sherriff, LSP Manager, said, “The Epping Forest Multi Faith Forum will provide a much needed and valuable link between the LSP and the local people it serves, especially those who are hard to reach. The LSP is very excited about the Forum and looks forward to its future development”. The Forum is particularly seeking representatives from the following religions: Buddhism, Hinduism, and Mormon, and those who consider themselves atheist or agnostic, but would like to hear from anyone with an interest in becoming involved either as a Forum member or a volunteer to help with forthcoming events or administrative support. Councillor Ann Haigh, who Chairs the Multi Faith Forum said, “The Forum will meet on a quarterly basis and members will be required to represent the interests of their faith community and provide feedback and information to this community about the LSP and its work. We’d like people who can raise concerns for the attention of the LSP but who can also help us develop ideas to tackle those concerns. This is a real opportunity to make a difference and improve quality of life in the Epping Forest district”. OPEN GARDENS’ DAY (24th June) : We are very lucky that so many people will still come and visit our gardens despite the weather! The stalwarts were out in force and although numbers were only half of last year we still made a healthy £2,000 profit. We thank most sincerely all those involved with the day. Special thanks to the gardeners of course who work so hard to make their gardens special and thanks too to all those helpers without whom we could just not run the day. Next year we, personally, will not be organising the event although we will be helping. So if you would like to be involved in the organisation of the day ( you don’t need to be gardener!) there are many aspects you could help with - correspondence, advertising, publicity and lots of chat to lovely people. Do please give us a call on 01992 812250 or any member of the Village Association. 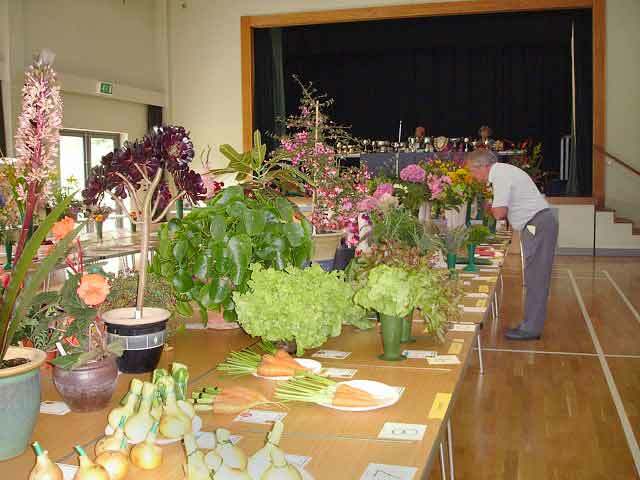 Open Gardens has been running for 27 years so we do hope you can help keep it going.